Obviously, our opinion of the ASUS ROG Strix GL753VD, or also called the ASUS FX753VD in some regions, doesn’t differ all that much from our verdict on the ASUS ROG GL753VE. We liked the keyboard in contrast to the wobbly touchpad while the chassis remains a bit neglected compared to the Lenovo Legion Y520 and the Dell Inspiron 15 7567, which also include plastic but feel more robust. And with the launch of the slightly more expensive Inspiron 7577 and the HP Omen 15 (2017), there are two more alternatives on the market. Still, if you are strictly looking for a 17-inches, the GL753VD is probably one of the few choices out there. While it's not exactly stylish, the ROG Strix GL753 does undercut much of the Pascal-bearing laptop competition. Beauty is in the eye of the beholder, as well, so if you don't mind the design, you're left with a reliable, fully featured 1080p gaming machine. If the Strix GL753's pricing is already pushing your budget, you're not going to be able to get more power without spending a couple of hundred dollars extra. It's one of the cheapest entry points into the Pascal line, and you won't be wanting for storage or connectivity. That said, I prefer the more restrained styling and higher-quality build of the VR-ready Editors' Choice HP Omen 17, and depending on your needs, you can configure one that doesn't cost much more than the Strix. The one exception is if you immediately need a laptop with more configuration options. You can still buy a version of the Alienware 17 R3 on Amazon (though Dell is phasing it out for newer models), some of which offer 4K displays. It's great for watching movies, but you sure won't be gaming at that resolution with a 980M GPU. 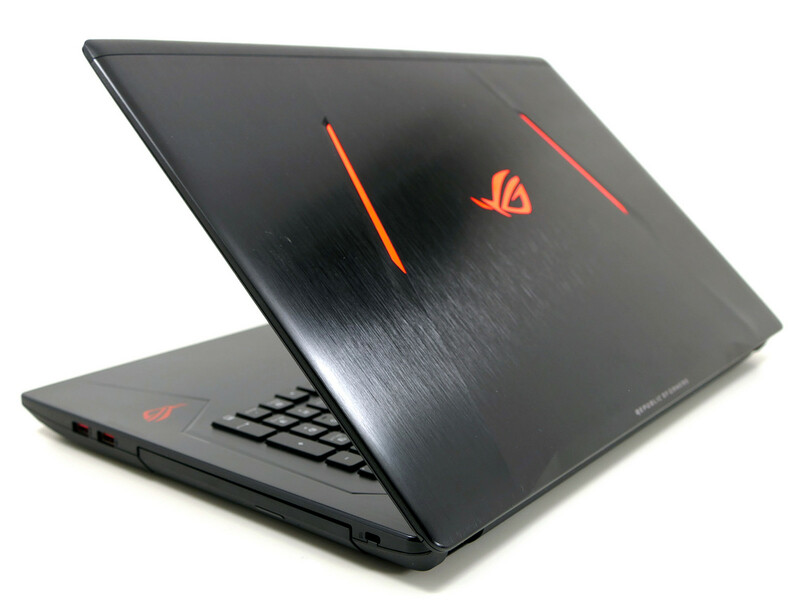 It makes great sense for a laptop gamer to get ASUS ROG Strix GL753VD. If you can accept less than maxed out settings at Full HD on the heaviest of games, there are no pitfalls I can think of. The overall graphics performance is solid, so is processor, RAM and all of that stuff. The large 17-inches panel is excellent for gaming and, say, photo editing. Of course you don’t want to carry this laptop around too much because it’s rather bulky and heavy (6 and half pounds) compared to regular laptops. But as a portable gaming station it is hard to beat this ASUS! Model: While Nvidia may have debuted their Geforce GTX 1080’s unrivaled power in both the desktop and notebook market not everyone can or would be willing to shell out that kind of moolah, this is where the likes of the Geforce GTX 1050 takes centerstage in the mainstream market. Along with the introduction of the Geforce GTX 1050, Nvidia has once again partnered up with Asus to produce a budget friendly gaming platform such as the ROG Strix GL753VD which is designed to cater the mainstream market. The Strix GL753VD is powered by Intel’s 7th gen Core i7-7700HQ processor along with the previously mentioned GTX 1050 and 16 GB of memory. Similarly, to the previous GL752 and GL702 models the design and construction of the GL753 remains top notch although the half the notebook is constructed out of plastic with some sections such as the lid being made out of aluminum. Overall rigidity and flex remains great and minimal which shouldn’t affect its 17-inch stature if but anything makes it much beefier than most 17-inch class notebooks. Although in actual size and weight the GL753 is about average in comparison to other competitors. Moving on to IO the GL753 is equipped with your standard LAN port, HDMI, mDP, USB type A and 1 USB type C including an SD card reader which makes connecting additional devices to the GL753 plentiful. Although special mention about IO should be made as the GL753 actual has an optical drive which has actually become a rarity in notebooks ranging from 15 inches and below. Taking a look at user inputs the keyboard layout remains similar to the GL702 with the regular WASD keys and the Spacebar being either slightly spaced apart or bigger than the normal respectively which should be a plus, incidentally the keys provide reasonable key travel distances and satisfying feedbacks which should please gaming typists. However, applying too much pressure causes the keyboard to somewhat flex. As for the touchpad, it remains good in terms of finger gliding but doesn’t have dedicated click buttons although they are sufficiently marked for recognition, other than that the clicks are crisp enough. The panel equipped on the GL753 is a FHD IPS based panel which should provide a reasonable view experience especially from angles, it is also brighter than averaging coming in at about 394 nits, however there seems to be some minor backlight bleeding. In actual gaming performance, the Geforce GTX 1050 should be better than the old GTX 960M by 30% or even equivalent to the old GTX 970M which is to say modern games should run fluently at high to max settings. Jumping to the audio department Asus has equipped a pair of front facing stereo speakers which produce a satisfying listening experience for both regular audio playback and even for gaming although it is lacking in terms of bass or high’s otherwise it is generally acceptable. Naturally gaming notebooks may pass with flying colors in the performance category but usually score mediocrely or badly in battery life tests. Suffice to say on Wi-Fi the GL753 topped out at 4 hours and 20 minutes which is about right for a notebook of this class. Final words being while battery life is about average it shouldn’t be the deciding factor when choosing a notebook of this class it actually remains well scored in terms of quality and features. 77.9%: This rating is not convincing. The laptop is evaluated below average, this is not really a recommendation for purchase.